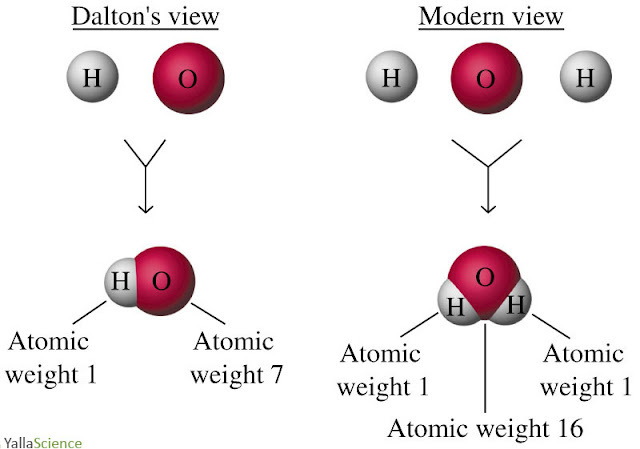 Dalton assumed a combining ratio of hydrogen to oxygen atoms of 1:1. Data at the time suggested that the mass ratio of hydrogen to oxygen in water was 1:7. Taking the atomic weight of hydrogen to be one, that of oxygen was seven. Modern data indicate that the combining ratio of hydrogen to oxygen atoms is 2:1 and that the mass ratio is 1:8 (or 2:16). If the atomic weight of hydrogen is taken to be one, that of oxygen must be 16.